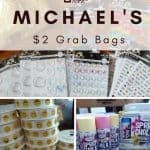 Head’s up: Michael’s has $2 grab bags again! Pictures of today’s haul are over on my Facebook page. I popped in Michaels yesterday afternoon to pick up something I needed for a project, and my daughter spotted a bin of $2 grab bags by the door. I had heard people talk about these online, but I’d never gotten in on the action. I just always seemed to be too busy for a trip to the store, when I heard the bags were out. Looks like luck was finally on my side. 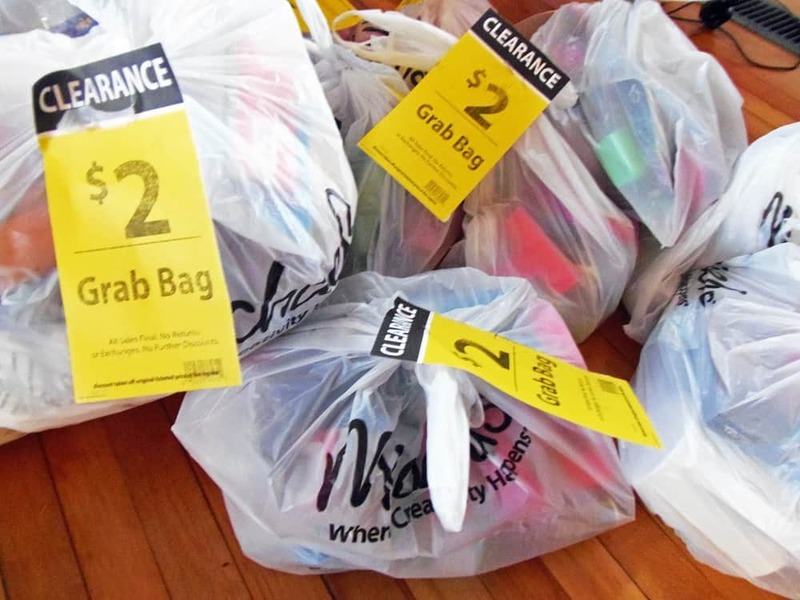 If you haven’t heard about this bit of bargain-shopping fun yet, here’s the deal: Michaels takes all of their unsold holiday merchandise and clearance items, dumps them in shopping bags, and sells the bags for $2 each. You can’t open the bags in store, but you can see enough through the plastic (and peeking through the top of the bag), to get an idea of what you’re getting. First, this is the contents of just one bag. As you can see, it contained a lot of stuff. 29 items in this case. 10 rhinestone purse mirrors. 1 cosmetic bag. 1 set of hair clips. 1 iPhone case. 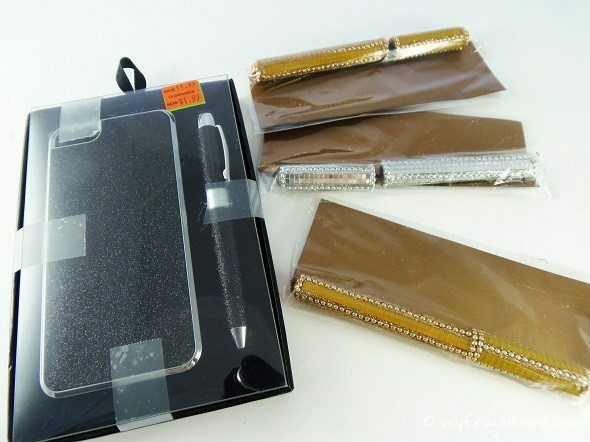 3 fancy pens. 3 pairs of socks. 1 2015 planner. 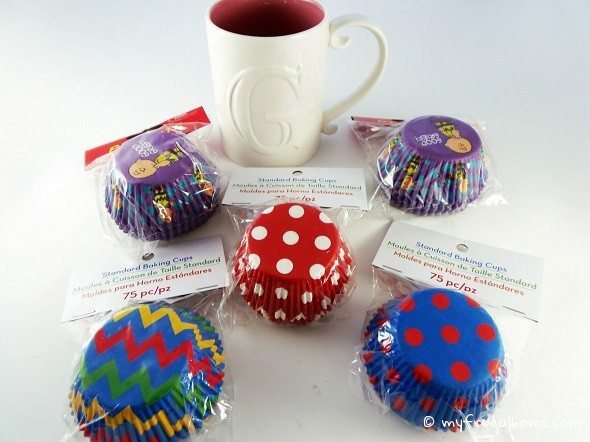 We’ll mix and match all of the stuff that I’ve shown you so far to create gifts when my kids get invited to birthday parties. I’ve been needing to restock my gift closet, so this was excellent timing. Here’s an example of what a finished gift might look like. 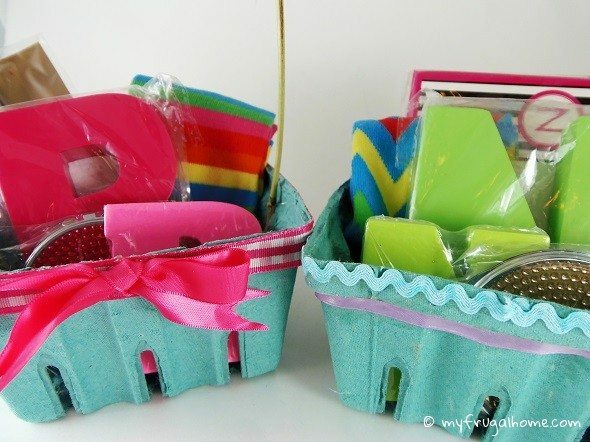 Each gift baskets has $.50 worth of items. Now that’s an affordable gift! 17 pairs of ear buds, 3 USB car chargers, and 2 USB wall chargers. 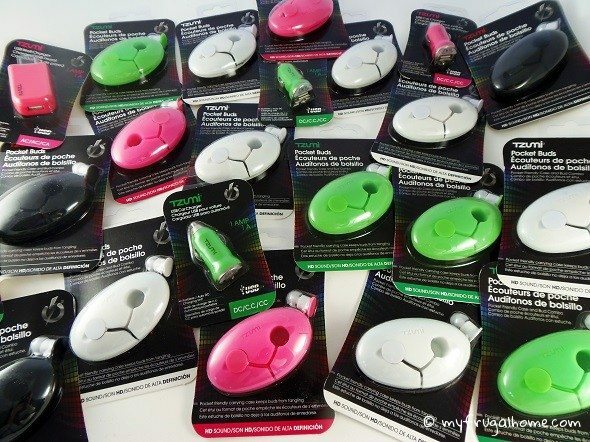 My kids use ear buds at school, and they never seem to last long, so I’ll add some to our school supply stash, and we’ll gift the rest. 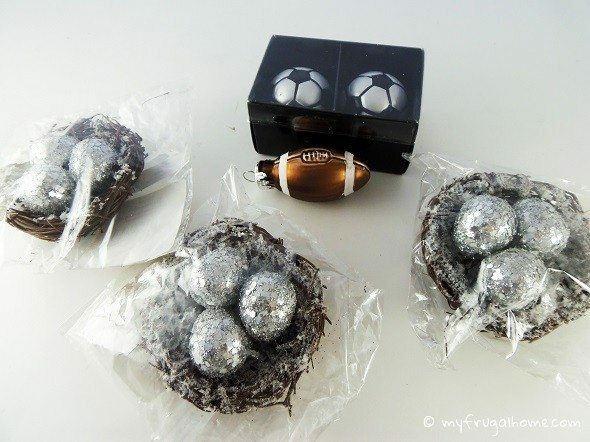 3 glittery bird’s nest decorations (I’ll use these as gift toppers). A set of soccer ornaments (these will be gifted to my daughter’s soccer-loving friend). 1 football ornament (destined for our next yard sale). 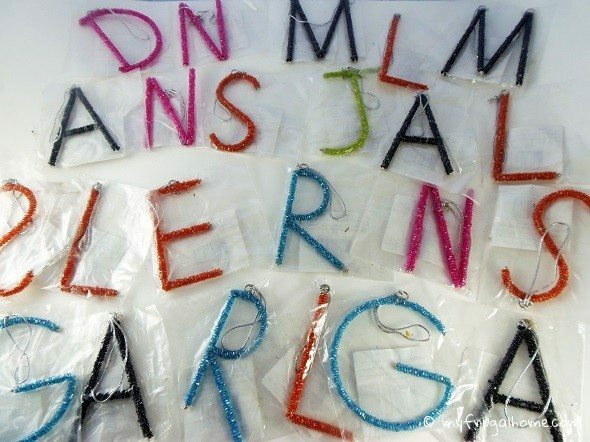 23 beaded letters. We’ll use these to top gifts. 6 packs of cupcake wrappers (one not shown). 1 mug with a “G” on it. Looks like a potential teacher’s gift to me. 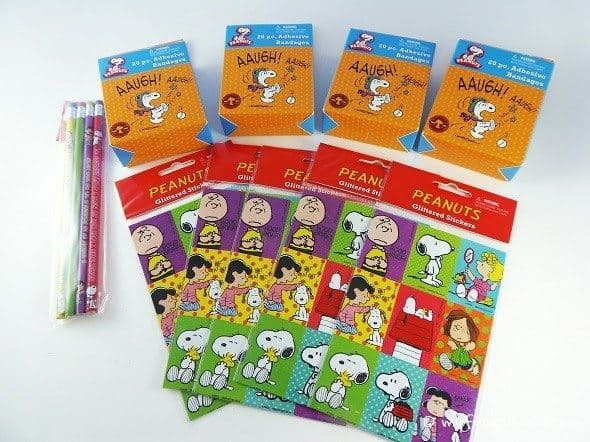 Peanuts merchandise. 4 boxes of bandages. 5 packs of stickers. 1 pack of pencils. My youngest daughter called dibs on this stuff. 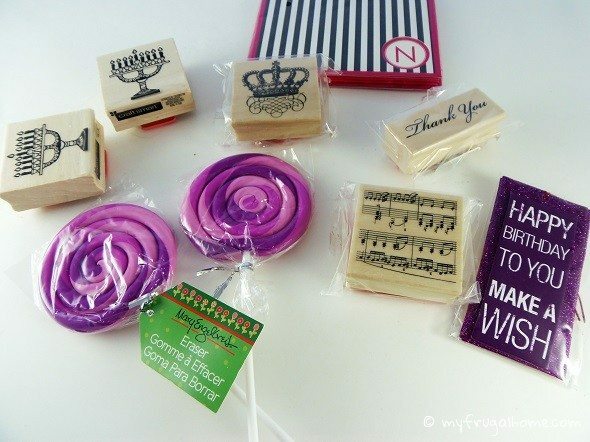 5 rubber stamps (I’ll use the “Thank You” stamp on my Etsy orders. 1 monogrammed notecard set. 2 lollipop erasers (the kids snagged these). 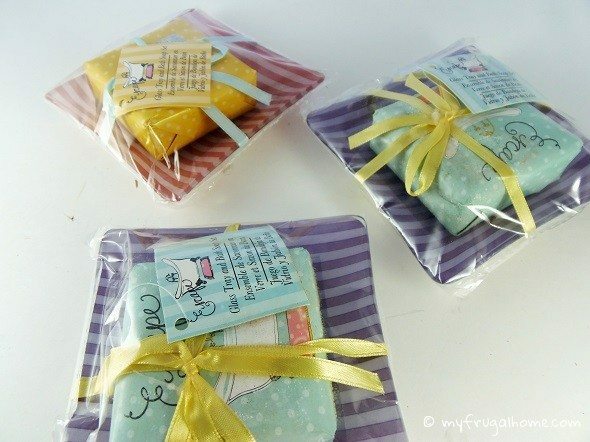 1 birthday gift tag set. 10 bags of cobwebs. 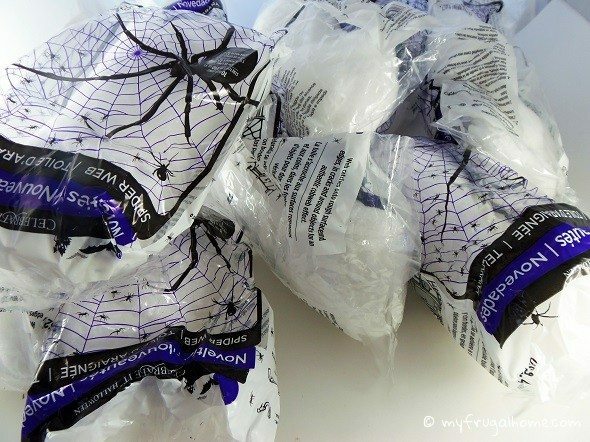 We’ll keep a couple bags because my youngest daughter thought they were cool (we’ve never done the cobweb thing). The rest will be yard saled. 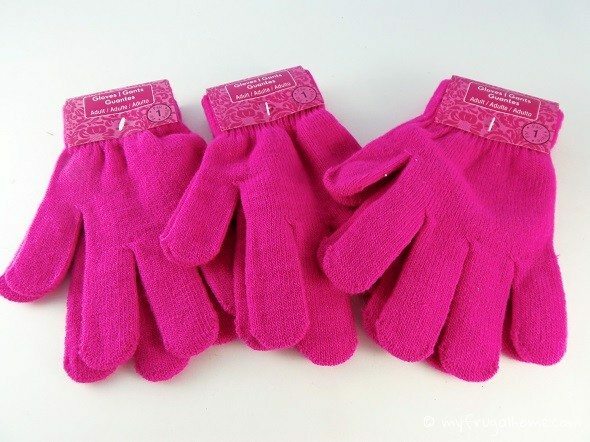 3 pairs of gloves. We’ll probably donate these. A Christmas stamp set. 1 Halloween necklace kit (we’ll give it to a Trick or Treater next year). 1 bag of sequins. 1 metal tag. 3 bars of soap, with soap dishes. Looks like more teacher’s gifts to me. All told, we came home with 199 items for $20, which averages out to $.10 an item. Not too shabby. 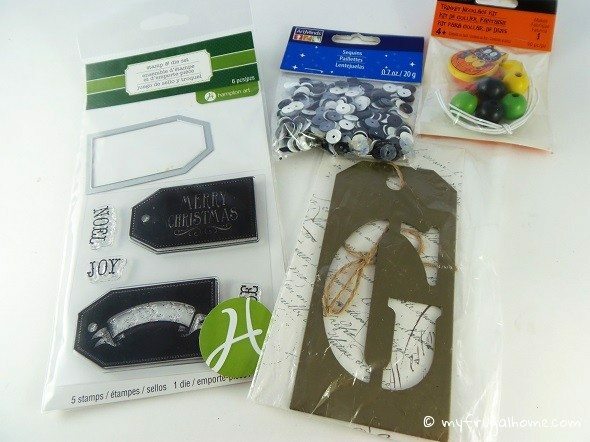 Have you ever snagged any of the Michaels grab bags. If so, I’d love to hear what you got. 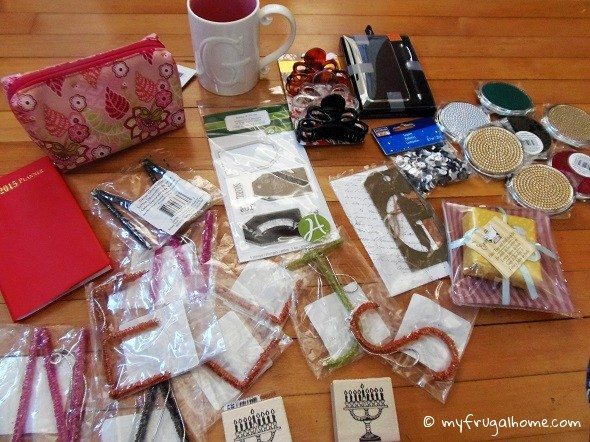 Thanks for sharing your grab bag items! I never heard of it until recently. Hi, Erin! I got a couple grab bags on Tuesday. 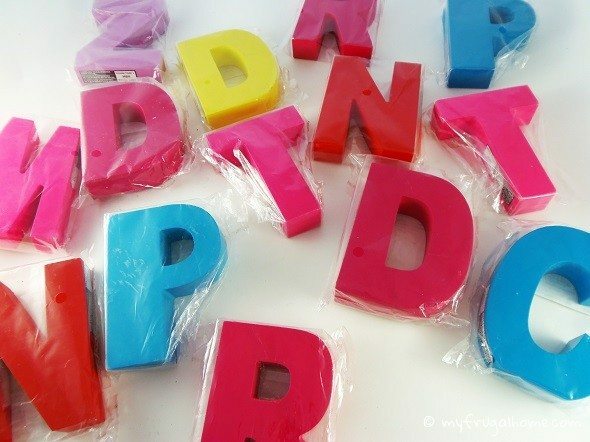 I got a good assortment of goodies…some wooden letters, notepads, Christmas cards, artificial flowers and picks, paper straws, muslin treat bag kit, and a snowman table decor kit. 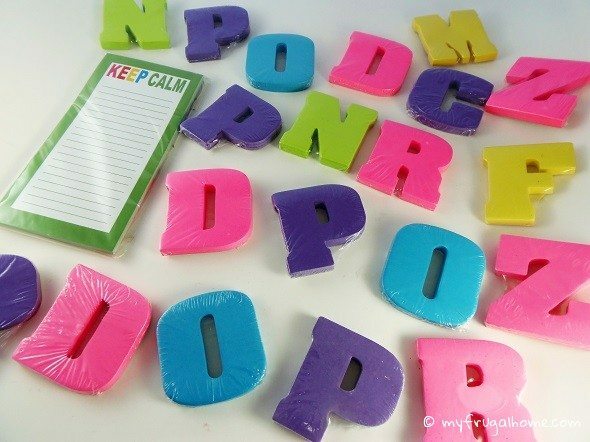 I was wondering if you got a k and i wooden letter that you would be willing to trade or sell? Sounds like you got some great stuff 🙂 I just checked my letters, and unfortunately I didn’t end up with either of those. I would have sent them to you if I had. After reading this i wanna run out to micheals. I have seen these bags every time I go but nvr thought anything good or worth while was in them. Def making a trip this week to grab a bunch of them. thanks for this tip. Do they always have them, or is it just a hit or miss sale? They do it several times a year. I’ll try to post a note in the forum (on the Freebies & Deals board) whenever I know they’re doing it. Hi- lucked into grab bags at my local Michaels today- Perfect items for Operation Christmas Child boxes! Between 2 bags I got 8 prs. of flip plops, 4 t-shirts and lots of other cool stuff! That’s awesome 🙂 We got some good stuff today, too. 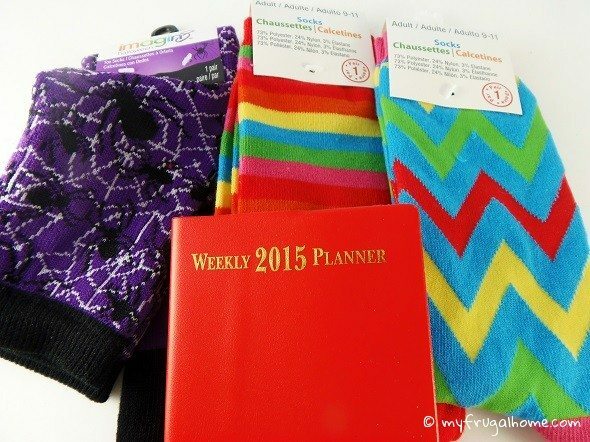 We even scored some craft supplies that were on our wish list. How do you find out which michaels store do them? I don’t know for sure, but I suspect it’ll be a week or so after Easter. They’ll be eager to move all the Easter and spring merchandise out by then. I’ll try to post a note in the forum when I hear that the sale has started. I am interested in purchasing your Unwanted Grab Bags !!! I haven’t seen this at our Michael’s here in Canada. But then the nearest store is 2 1/2 hours from me I might just miss this. I just found out about this, last year. Got some very good deals. Now they are out, but mangers say to call weekly to see if they have put them out. I will be calling every day. My local store seems to discount things down to 70%. Then, everything that hasn’t sold gets bagged up and sold for $2 a bag. Yep, I’m in the US. They may handle markdowns differently in Canada, or it may be somewhat at the discretion of each store’s manager. Hard to say. My local Michael’s has $2 Grab Boxes and I was lucky enough to pick up several right after Easter 2016. One box had 12 Disney Frozen t-shirts for kids…we gave them away for free on a local swap site to some very excited little girls. I will never be able to pass up these specials again! How often does Micheals do grab bags? That sounds awesome, I want to go, is it a once a year thing? Never seen it before. They usually do it after every holiday/season, so it’s pretty frequent. I’m working on putting together a schedule based on when they’ve offered grab bags in the past.